Participate in Motion Graphic webinar, hosted by John Dickinson. John will integrate Imagineer Systems mocha, GenArts Sapphire, Boris FX into Adobe After Effects. Get ready for the exiting online learning of Motion Graphics. Motion graphics had broaden it’s application areas. Now, it has been an integral part of movies, commercials, corporate presentations, web ads, mini series and what not. Every time, it comes with new form of creativity and new tool sets. The old styled mundane graphic transitions are completely outdated. The motion graphics webinar will be conducted by the veteran artist John Dickinson from Motionworks. John is an renowned motion graphic designer, trainer and presenter. To keep pace with current age of astonishing visual art, John will not be limited for one product or software. In the webinar lesson, he will be using mocha Pro 5 with Sapphire (GenArts) 10 and Continuum Complete 10 (Boris FX). It will be all inside Adobe After Effects. Take note of all quick tips, creative inspirations and design forward thinking. The webinar is presented jointly by Imagineer Systems, Boris FX and Sapphire. Based on the concept of Halloween, it is titled as ‘The Graveyard‘. 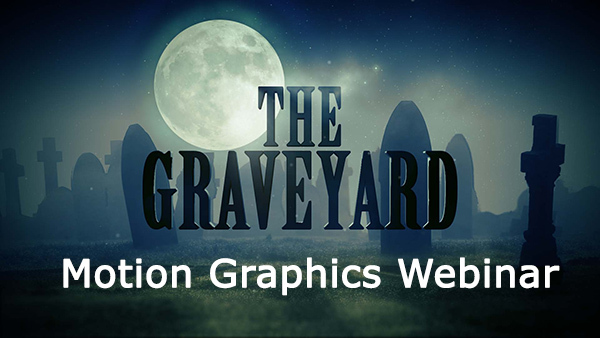 Essential details of this motion graphics webinar is as follows. 28th October, Friday by 2 pm EDT/ 11 am PDT. Check out accurate time-zone converter for your country. Fill up this registration form to confirm your entry in motion graphics webinar.